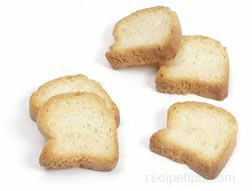 To brown a slice of bread or another food product by exposing it to direct heat or by baking the slices. As heat is applied to the bread, the sugars contained in the bread ingredients actually caramelize to create the golden brown color that appear as a result of the toasting. Food consumers can prepare their own toasted products with an oven or a toaster. Ready-to-eat products are also available that have been baked and toasted, such as Melba toast.